I will no longer be publishing Edible Chesapeake magazine. The decision is the result of much reflection on how best to balance the needs of my family and myself as a small business owner, with the needs of the local food community of which Edible Chesapeake has been an important part since 2005. The recently published Fall 2009 issue, with the incredibly scrumptious apple cider donuts on the cover, is the last of my tenure as publisher and editor. It is uncertain at this time whether Edible Chesapeake will return under a new publisher. Frederick Wine House is having a number of interesting looking wine classes over the next month. The Champagne and sparkling wine course looks great! Loyal reader(s?) may remember my review of the book The Billionaire’s Vinegar. As a follow up to the story I saw that the venerable British wine critic Micheal Broadbent settled his libel and defamation suit against Random House, the publisher of the book. The book was less than flattering to Mr. Broadbent. The amount of the monetary settlement is undisclosed, but Random House issued an apology and has agreed not to distribute the book any more in the United Kingdom. The New York Times story can be found here. Decanter (which he writes for) had a different take on it but did say that he was going to celebrate with a magnum of 1990 Mouton while pondering whether to seek an injunction about the film based on the book. 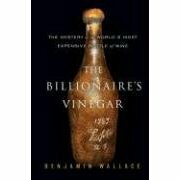 Continuing my posts on books I’ve been reading: I just finished up The Billionaire’s Vinegar: The Mystery of the World’s Most Expensive Wine by Benjamin Wallace (also available from FCPL). It was an interesting, if a little dry at the beginning, read. Briefly it tells the story of the wine market for rare old (18th and 19th Century) wines. It focuses on a number of bottles sold by a German dealer to various individuals, including a billionaire, that were purported to be from Thomas Jefferson’s cellar in Paris. I enjoyed the book especially the last part where it becomes a detective story in trying to figure out the authenticity of the bottles. The story sweeps up so many eminences in the field of wine: Robert Parker, Michael Broadbent, and Jancis Robinson to name just a few. It was fascinating to see how they became vested in the authenticity or inauthenticity in the bottles and how some people turned a willful blind eye, or at least indifference, to the doubts about the bottles just so they could have bragging rights about tasting or owning such a bottle. Like all good tales it ultimately is about much more than just wine: ego, pride, greed and other facets of human nature. For someone who has a wine cellar for the sole purpose of keeping wine for drinking, it struck me how these rarefied collectors bore about as much relationship to the average wine drinker as big game hunting does to cooking. Without spoiling the ending by posting here I’d love to know what you think. I just finished a great book. It’s called In Defense of Food by Michael Pollan. He is the author of the bestseller Omnivore’s Dilemma. Both are phenomenal books and really force you to think about what you eat, and where your food comes from. Highly recommend that you read both. I’m still digesting (no pun intended) In Defense of Food, but The Omnivore’s Dilemma was hugely influential on me. Caused me to reexamine my 17+ year strict vegetarianism to become more of an omnivore (flexitarian anyone?) The Frederick County Library system has copies of both books. Read OD first. Let me know.